Fire In Dubai Skyscraper Forces Evacuation Of Residents : The Two-Way No one was killed in the blaze at the 86-story Torch Tower that began early in the morning in the United Arab Emirates. It was extinguished within a few hours. 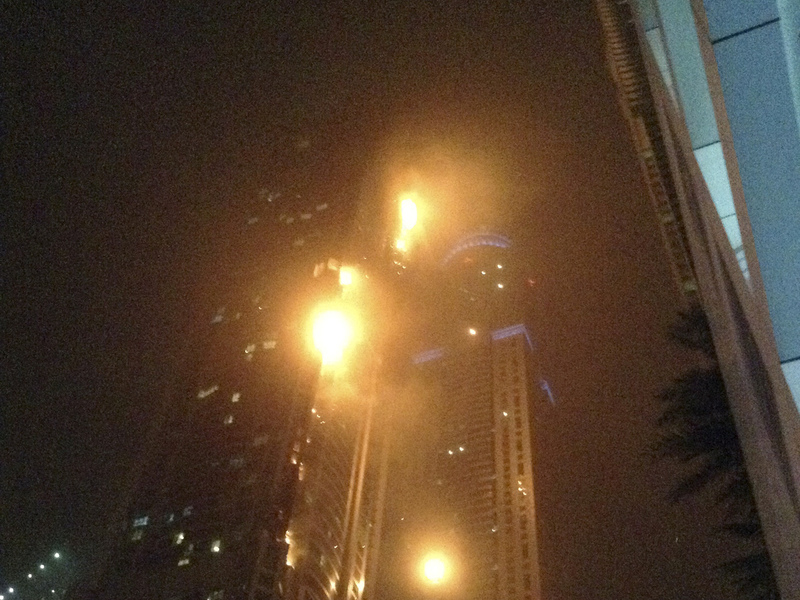 A fire blazes at "The Torch," a residential high-rise tower, in Dubai, on Saturday. A fire in one of the world's tallest residential skyscrapers in Dubai forced the evacuation of hundreds of people before it was safely extinguished with no deaths. Local media reports that the blaze broke out in the 86-story Torch Tower at about 2:30 a.m. local time in the United Arab Emirates. Strong winds helped fan the flames and debris from the fire drifted down onto nearby streets, the BBC says. "Police blocked off areas around the Torch. Residents of at least one neighboring tower were told to evacuate as a precaution because of strong winds, but they were later allowed back inside. Two residents of the Torch said they were told the fire started around the 52nd floor. Flaming material falling from the initial fire then set a lower part of the building ablaze, they said." "In an hour-and-a-half, the fire is almost out on about 60 floors, it looks like mostly the outer apartments that are damaged," eyewitness Rola told the BBC. State-run WAM Emirates News Agency, cites Dubai Police Chief Maj. Gen. Khamis Mattar Al-Muzeina as saying that four people were treated for minor injuries. The skyscraper is 1,105 feet tall, Gulf News reported. False fire alarms have plagued the building as frequently as three times a week, the news site said, citing a resident. Reuters says that the cause of the fire was not immediately clear. Investigators were examining the scene, but there are no indications of foul play, al-Muzeina said.